1 "Dad, can you help me make a birdhouse?" asked Cassie. 2 "Perhaps," said Dad. "What kind of bird do you want to make a house for?" 3 "Do you have to make it for a certain kind of bird?" asked Cassie. 4 Dad nodded. "Birds come in all sizes. Many have different needs. A house that a sparrow likes could be all wrong for a robin or a dove. However, I'm not sure they would like a birdhouse, anyway." 5 "I never thought of that," said Cassie slowly. "Do you think we could make a bluebird house?" 6 "That would be an excellent idea," said Dad. "It would be so much easier than building a house for, say, hawks." 7 "What is so different about a hawk house?" asked Cassie with a puzzled look on her face. 8 "Many hawks are large birds," said Dad. 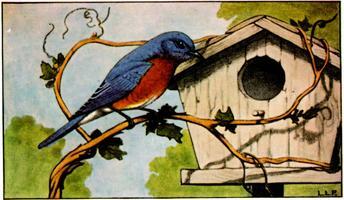 "They also don't live in birdhouses like some of the smaller songbirds. Many hawks build their nests in the tops of trees. They use sticks to make a platform." 9 "That would be scary to be up so high," said Cassie.